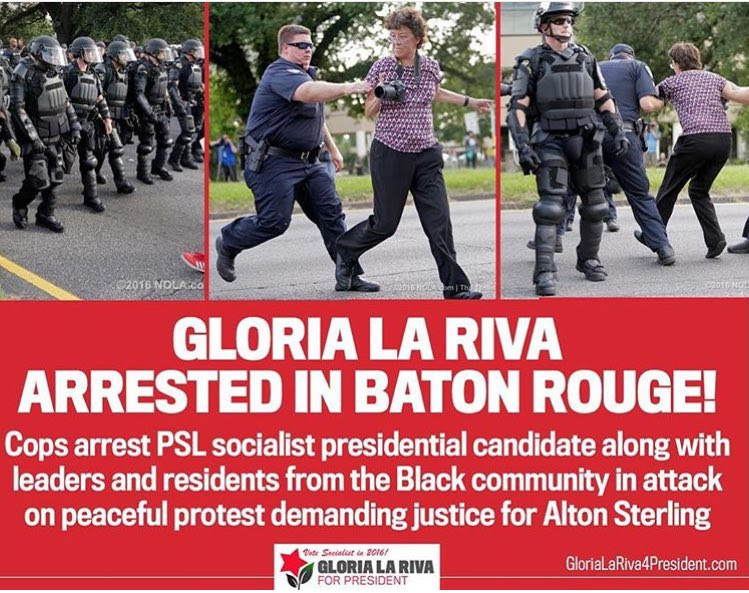 Gloria La Riva, the presidential candidate of the Party for Socialism and Liberation (PSL), was targeted and arrested around 6:30 p.m. on July 9, along with 13 others, while filming a peaceful community demonstration and the actions by the police. Gloria was one of the first people arrested in a night marked by repeated police attacks. By midnight, more than 100 people were arrested as the police moved toward shutting down the city and suppressing any form of peaceful protest. Gloria and the others remain in detention at the East Baton Rouge Parish Prison. Gloria La Riva came to Baton Rouge to show her support for the family of Alton Sterling and the Black community, which has faced continuous violence and repression from the police. Alton Sterling’s vicious, cold-blooded murder on July 5 by police while he lay prone on the street was captured on video by activists. Sterling was selling CDs outside of a convenience store. He was held down by police and killed at point blank range for no reason. The release of that video ignited a new round of nationwide protests against the epidemic of murders carried out by the police against civilians in the United States. Now, the police in Louisiana are trying to crush any protests against their racist and murderous conduct. Two demonstrations had been called on Saturday, July 9 to demand justice for Alton Sterling, Philando Castile and all victims of police murder. The first demonstration was called at the Triple S store where Alton Sterling was executed by a Baton Rouge police officer after two officers held him on his back and then shot him four times in the chest. Demonstrators at the Triple S store came to join others in front of the Baton Rouge Police Department on Airline Highway at 6:00 p.m. last night. Several hundred people from the local community were gathered to demonstrate and take to the streets to demand justice. The police, in military formation and dressed in riot gear, moved in a line toward the peaceful demonstration, targeting any individual who was playing a leading role or documenting the demands of the people. The demonstration was completely peaceful, composed of people from the surrounding community just minutes away from the Triple S store where Alton Sterling was murdered. People made and carried homemade signs and brought supplies of water that were distributed to their fellow community members to withstand the Baton Rouge summer heat. The people were dispersed after the police pushed back the demonstration onto the four corners in front of the police department. The Circle K immediately became a center of people’s organizing, where demonstrators from the community coordinated others to go back to surround the police department, holding homemade signs and leading chants. Gloria La Riva and the others arrested were brought to East Baton Rouge Parish Prison located at Brig. General Isaac Smith Avenue. At 10:22 p.m. the police again lined up in a military formation taking back all the corners, pushing people into the last area of the demonstration at the Circle K gas station and store. By this time police helicopters loomed over the remaining demonstrators with the threat of the final move against those who remained. Then police, wielding batons, chased protesters in all directions, dispersing the demonstration. By midnight Baton Rouge was under a virtual lockdown, with restaurants and other businesses all closing down early in response to the repression that the police were carrying out. The police had clearly received the go-ahead to suppress any organizing in the community to demand justice. There continues to be a heavy police presence throughout the city. As of this afternoon, July 10, the police have not filed charges or bail amounts for the release of the those arrested. In front of the Parish Prison loved ones of those arrested over the past two nights gathered to receive word on those in the prison. Gloria La Riva has been in communication with teams assisting with the release of those in the Parish Prison. La Riva is urging the people to continue to fight for justice and to attend the demonstration planned today at 4:00 p.m. at 445 East Washington Street, Baton Rouge, La.